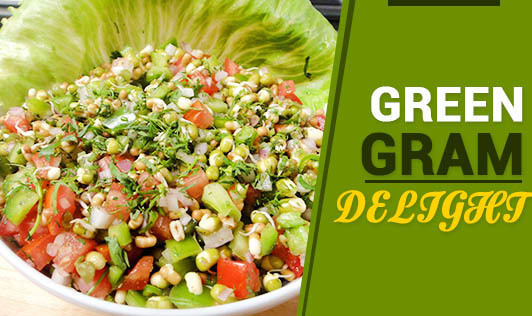 Green Gram or Moong Dal is a nutrient-rich food packed with fibre, vitamins (A, B1, B6, C, and E) and minerals (iron, calcium, and potassium) and is a good source of vegetarian protein. Make this a part of your daily diet to ensure good immunity, flawless skin, and keep lifestyle diseases at bay. It is much healthier to have it in its sprouted form as it increases its vitamin and antioxidant content. Try out this recipe for a nutrient punch. Soak the dal in water overnight. Tie up the soaked dal in a clean, white cloth, and allow it to sprout (it will be more nutritious if left for 2 days). Finely chop the onions. Wash the carrots and chop them finely. Put in seasoning; then add onions and carrots. Sauté for just a minute or two. Then add the sprouted dal. Add the scraped coconut. Stir well. Squeeze in the lime juice and add salt and mix well. Note: This mix can be had as a nutritious snack or as a side dish, served as part of a meal.